International Auto Show was a crossover vehicle influenced by Airstream's iconic design and the optimism for the future that Stanley Kubrick captured in his 1960s cult film 2001: A Space Odyssey. The whole idea behind the Ford Airstream concept was to create a vehicle for adventures, touring and traveling long distances in a unique design. 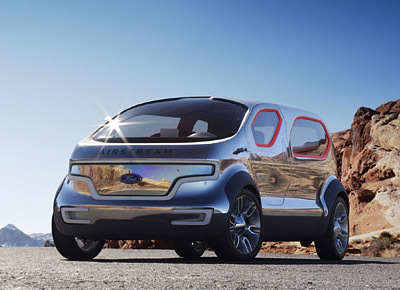 The Ford Airstream concept is powered by a plug-in hydrogen hybrid fuel cell drivetrain that operates under electric power at all times. This advanced fuel cell system is lighter and cheaper than today's fuel cells, and as a further bonus it can operate in the dead of winter, most other fuel cells struggle when the temperate drops below freezing. 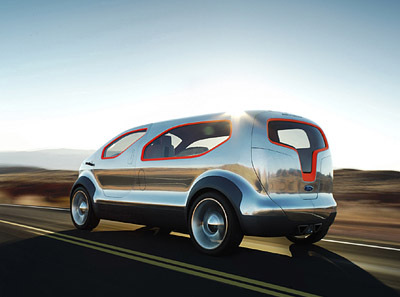 The unusual design of the Ford Airstream concept uses several different influences, including aircraft and spacecraft for the windows, Airstream's mirror Finish bodywork - on the concept Ford have used a unique reflective paint. The Ford Airstream concept's bold, futuristic front-end explores a new look for Ford, encapsulating the single-surface grille and headlamps into the same graphic. 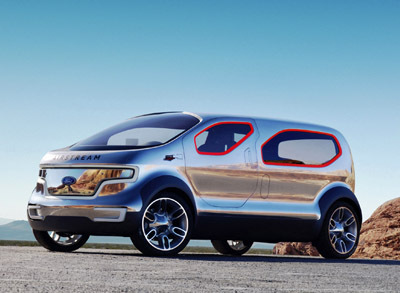 The Ford Airstream Concept's doors are asymmetric as well, allowing for easy loading of passengers and cargo. In addition to the driver's side hatch, the passenger side features a power clamshell door that runs two-thirds the length of the vehicle. A three-door hatch finishes the rear of the crossover. 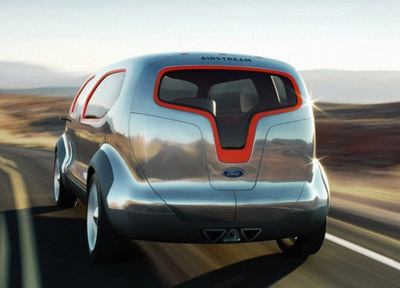 Inside, the Ford Airstream concept features a floating instrument panel with flush-mounted, touch-sensitive controls. A multifunction single gauge display provides the driver all primary information. A Sharp dual-view screen centrally mounted on the instrument panel provides a camera view and secondary driver-oriented information, while allowing the front-seat passenger to view DVDs and post mobile blogs. Modern, pod-shaped swiveling captain's chairs rotate so the driver and front-seat passenger can easily socialize. 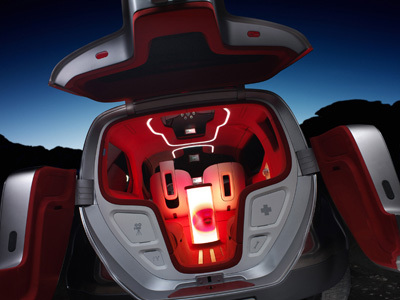 In the rear of the Airstream concept, lounge-like seating is sculptural, creating a continuous cocoon-like environment wrapped in bold red fabric. 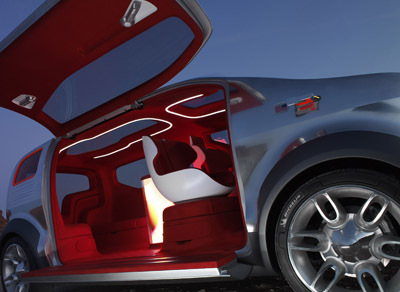 The focal point of the rear seating area is a 360-degree screen for entertainment and games. The unique screen not only creates ambient mood settings including a modern lava lamp and virtual fire, but it also is an entertainment source featuring games and a live camera feed.